In this article I explain the top scores for the 1st box "Cardboard Box", which is the easiest box so far. There're hacked (fake) scores in front of the first few boxes of "Cut The Rope" ver. 1.5 (Full version). Shown in the above screenshot are the actual top scores for the 1st box "Cardboard Box". The gameplay of "Cut The Rope" ver. 1.5 is basically the same as ver. 1.4, which is the same as vers. 1.1 to 1.3 except that the "scrolling animation" bug has been removed, as described in my earlier articles. iPhone 3G and iPhone 4 players still have to play differently in this game. For other devices like those running on Google Android, the differences could be even greater because I read some of the users' comments in the Amazon.com app store that their devices (maybe old phone types) cannot perform multi-touch, so they cannot perform multiple actions at the same time like the iOS devices. I hesitated to write about the techniques in this game due to all these differences, because some methods can only work on certain devices. Just in case some of you are wondering, besides using the "scrolling animation" bug to boost our scores, we also used other "extreme" techniques like skipping bubbles and using the levers to swing the candy very quickly instead (not easy to do it for some levels, have to try many times). Other techniques include multitasking (performing a few actions at the same time) and using a few fingers to play (e.g. using 2 fingers to move 2 levers and 1 more finger to cut some ropes). "dntn31" jailbroke his iPhone 4 and copied over his old iPhone 3G scores (mentioned in my earlier article), so his scores were "mixed" but he didn't intend to cheat actually because last time he didn't know about the different gameplay problem. In vers. 1.1 to 1.3, the top score was 141,770 pts. Read my article More Changes to Level Design: Levels 1-21 & 1-23 (explained why the total achievable score for this box has been increased). 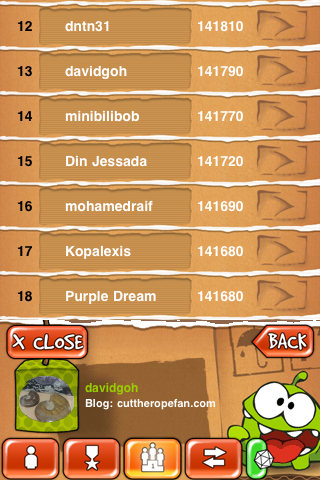 A new player "mohamedraif" just told me in the comments for the article "Toy Box" Leaderboard Top Scores (1st Aug 2011) that he managed to beat the old top score of 141,680 pts by 10 pts.